one of the best things you can do for your plumbing system. Today we are going to clear up some common misconceptions about drain cleaning. This is a common misconception about drain cleaning. The truth of the matter is that unless you are really experienced and have good working knowledge of your homes plumbing system, you shouldn’t attempt to clean your drains yourself. Yes, some homeowners are savvy enough to handle this task, but the majority of them risk causing more damage. A professional is always the best route to ensure the job is done right the first time. This is one of the worst misconceptions about drain cleaning, and unfortunately is widespread. To protect your drains, you must watch what goes down the drain. Many people end up treating their garbage disposals and toilets like trash cans. This can lead to widespread problems and serious clogs. 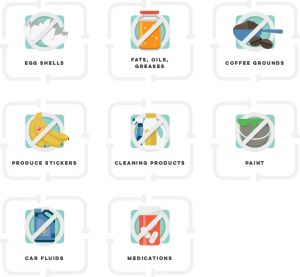 Here are some things to never put down the drain include: food waste, glass, paper, diapers and wipes, feminine products, hair, dental floss, prescription medications, and harsh chemicals. It is important to know only watch what goes down the drain to protect your drains, but also to protect the environment. Remember everything that goes down the drain could potentially end up in our rivers, lakes, streams, and oceans. Whenever faced with sluggish drainage, many homeowners are quick to reach for the liquid drain cleaner. This is a huge mistake for a couple of reason. For starters, liquid drain cleaner isn’t all that effective. At best it will provide temporary relief, but not actually fix the problem. You may end up with another clogged drain just days after use. 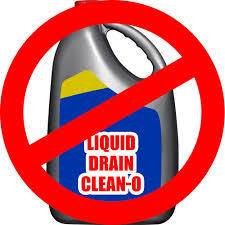 Liquid drain cleaner can also do more harm than good. It is a harsh chemical designed to eat through clogs. The problem is that it can sometimes eat through more than just the clog, but right through your pipes. And since, it it a harsh chemical, it is also dangerous to handle. It cause cause severe chemical burns, and cause respiratory problems if inhaled. It is also not good for the environment, as we mentioned above, everything that goes down the drain can eventually end up in our water supplies. When faced with a clog, slow drainage, or a backup issue, it is always best to call a professional. 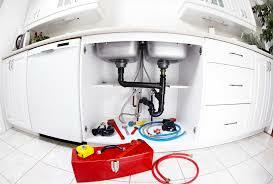 With the proper tools and techniques a professional plumber can more accurately pinpoint the problem and get it fixed correctly. It may be a simple clog, however it could be a more serious problem. Are you willing to run the risk or more damage being done? To learn more about drain cleaning or to schedule your appointment contact Rooter Hero today!